This workshop is for those who want to live more boldly. You are the first organization who must change. My hope is that you learn some practical applications, inspiration, and have some new ideas for leading, protecting yourself, and keeping your spirit alive. May you enjoy with a full heart the fruits of your labor. NASA needs you. The world needs you. Extreme self-care means putting the quality of your life ahead of everything else: saying no to things that no longer support your true priorities; basing choices on what you want, rather than on what other’s want; and spending your time and energy on what matters. 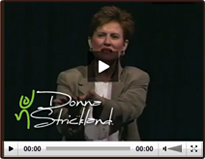 Posted by Donna Strickland in Dynamic Keynotes, Free Resources, Leadership and Team Development. Do you need a pick-me-up, a take–care-of-our-team, nurturing, spirited, content rich, and healing experience to strengthen your relationships with one another, yourself and with your patients? If you need to refresh, relax, reflect, and remember who you are what you are all about…then this is the program for you!! Take a “time out” to deal with your own sore spirit, so you can SOAR!! Understanding Our Big Picture, Part & Plan as it relates to Goals and Responsibilities. What is the Big Picture of our Company? How does our Team fit into the Big Picture? What is the Part we Play? And what is our Plan? Every member needs to know their own goals and responsibilities as it relates to the larger mission at hand, the “Big Picture” of the organization. Knowing the above answers are just the start. Then each team needs to understand how we are going to accomplish our work.